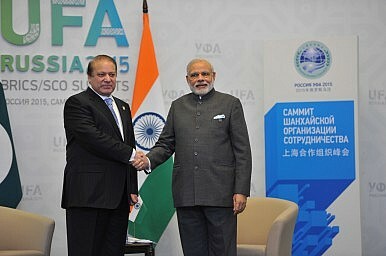 India and Pakistan joining the Shanghai Cooperation Organization won’t smooth the forum’s transformation. Pakistan and India’s bilateral ties have deteriorated in last few months. The release of Zakiur Rehman Lakhvi, the main planner of the 2008 Mumbai terror attacks, from prison and Pakistan’s refusal to ban Lashkar-e-Taiba (LeT), a group accused of carrying out terrorist actions in India, has become latest bone of contention between the two neighbors. India has taken an aggressive stance toward Pakistan while maintaining that any peaceful dialogue with Pakistan would require a peaceful environment, which is impossible unless Pakistan takes action against terror groups based within its borders. Moreover, Indian Prime Minster Narendra Modi, during his recent visit to Bangladesh, openly acknowledged and acclaimed India’s intervention in East Pakistan’s separation in 1971, which has drawn acute criticism from Pakistan. The Pakistani prime minister’s advisor on foreign affairs remarked afterward that Modi’s “open admission” of Indian intervention in East Pakistan, while regretful, justifies Pakistan stance. Pakistan, for its part, has alleged that India’s intelligence agency, the Research and Analysis Wing (RAW), is openly supporting and funding terrorist outfits in Karachi. Recently, a BBC report, in a rare revelation, alleged that the Muttahida Quami Movement (MQM)–the largest single party in urban Sindh–has been receiving funding from Indian authorities. India rejected the allegations. Moreover, Pakistan maintains that India’s proactive policy toward Pakistan is aimed at undermining its latest counter-terrorism operations across the country. Pakistan is reportedly planning to raise the issue of Indian involvement in Karachi and Balochistan at the United Nations. A temporary lull, resulting from a meeting between the both countries’ heads on the sidelines of the SCO summit in Ufa, Russia, is gradually succumbing to the traditional pessimism. Since that meeting, events, by and large, have followed their predictable course: Pakistan claimed to have shot down an Indian spy drone while India maintains that none of their drones was shot down anywhere. Moreover, firing incidents at the Line of Control (LoC) have surged: a United Nations Military Observers (UNMOGIP) team in India and Pakistan visited the LoC to view the damage from escalating firing incidents. During the Eid festivities recently, the Pakistani High Commission in New Delhi invited Kashmiri separatist leaders, raising tensions (India doesn’t accept separatist leaders as legitimate stakeholders in the Kashmiri peace process). Additionally, Pakistan vowed that it will continue its “full moral, political and diplomatic support to the people of Jammu and Kashmir in their legitimate struggle for self determination.” An earlier invitation of Kashmiri separatist leaders in the Hurriyat party by the Pakistani High Commission became the reason for cancelling foreign secretary-level talks between the both countries. Both countries’ opposing postures regarding these disputes are going to be a sticking point in the SCO. While Pakistan would like to see the Kashmir issue given more importance, India is likely to use the forum to push Pakistan toward taking more concrete steps to rein in anti-India militancy. While the Mumbai 26/11 trial process, reflecting Indian interests, was a talking point during the SCO summit meeting between the both countries’ prime ministers, Kashmir–a core issue for Pakistan–did not make an appearance in the joint statement issued after the meeting. Perhaps it was a condition discussed in advance–or demanded by the India–that the Kashmir would not be become part of the SCO’s platform. Moreover, while India does not recognize any regional or international body’s role in its bilateral territorial disputes with Pakistan, the latter insists on third party mediation. Pakistan’s prime minister, during his Shanghai Corporation Organization address, said that if the true spirit of the SCO is to be realized, “we must work together” to “resolve [our] outstanding disputes.” Moreover, while meeting with UN Secretary-General Ban Ki-moon, Pakistani Prime Minister Nawaz Sharif said that the UN should implement its resolutions on Kashmir in the Security Council. With SCO member states wary of the South Asian agenda, which with Pakistan and India’s inclusion would inevitably become part of the forum, the group maintains that it will not host discussion of any bilateral disputes. Uzbek President Islam Karimov, during the SCO summit, issued a statement saying that the addition of India and Pakistan “would not only change the political map, but would change the balance of power. This is not a simple issue, and it needs to be discussed.” Moreover, it’s also probable that the planned expansion could see a blockade from the Central Asian member states, as working guidelines of the forum are consensus based: “De jure, the process has yet to be fully clarified. It is quite possible that an existing SCO member could block their entry,” said Sanat Kushkumbayev, deputy director of the Kazakhstan Institute for Strategic Studies. While China welcomed Pakistan and India’s addition to the forum, it is also concerned that any confrontation between the nuclear armed states could become a barrier to the effective workings of the SCO. China and Russia’s growing security and energy interests in the region demand close cooperation between India and Pakistan, particularly in Afghanistan where both countries face diverging interests. A deteriorating regional security situation topped the agenda list of the recent SCO summit and a ten year development plan related to close security cooperation among its member states was confirmed, but its terms remain unaddressed. Moreover, the China-Pakistan Economic Corridor (CPEC) and Beijing’s broader regional “One Belt, One Road” plan to connect Central Asia with China and Europe will remain a dream as long as the security situation in Afghanistan is unstable. Perhaps one area of overlapping interests for SCO members–including Pakistan and India–is in a stable and peaceful Afghanistan. Historically, Pakistan has always remained apprehensive of India’s role in Afghanistan as it sees the situation in zero sum terms, at the expense of its strategic security interests. Perhaps it’s one of the reasons that India has never been part of any peace process between the Afghan Taliban and other regional stakeholders. Furthermore, while Pakistan, for its part, feels threatened by the idea of an Indian presence in Afghanistan, India has its own interests there. India’s growing economic needs will eventually necessitate a much needed expansion of ties with its energy-rich neighbors in Central Asia. Moreover, any planned oil and gas pipeline from Central Asia to South Asia must go through Afghanistan, which further accentuates the geostrategic centrality of Afghanistan for any regional economic plan–including the Turkmenistan-Afghanistan-Pakistan-India (TAPI) gas pipeline. Given these imperatives, reconciliation between India and Pakistan in Afghanistan would be anything but a challenge for the SCO. Moreover, with India openly calling Chinese construction activity in Pakistan-occupied Kashmir “unacceptable,” and China blocking Indian questioning of Pakistan over terrorism-related sanctions move at the United Nations, the SCO is likely to experience some tumultuous times with Pakistan and India on board. The addition of these two perpetually quarreling neighbors to the SCO will lead to major changes in the organization’s outlook, and with addition of their competing interests, any smooth transformation of the SCO as an organization will remain a challenge. Kashmir's Reckoning With the Implications of the China-Pakistan Economic CorridorIs Pakistan’s Stability in India’s Interest?Why the Pakistani Establishment Is Rooting for the BJPIndia-Pakistan Tensions Test the Shanghai Cooperation Organization's MettleWhat Message Does the Latest India-Pakistan Crisis Send to Militants in Kashmir?